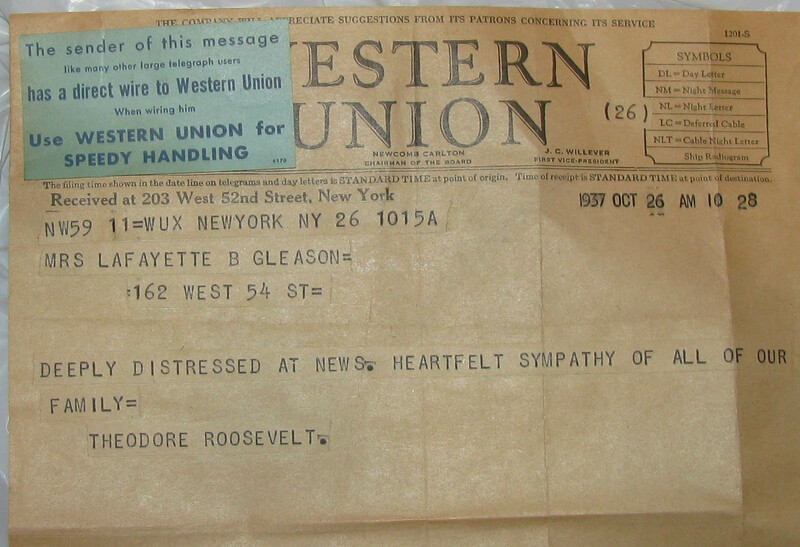 Hi, this is not presidential but it is a telegram from a son of a president, Theodore Roosevelt, JR. It is a condolense to Mrs Lafayette Gleason on the death of her husband Lafayette. Mr Gleason is a NY politician. You can google him for more information. 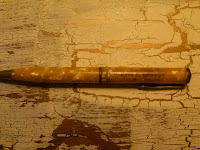 If you can help Del and provide him with information on this item please click on the comment button. 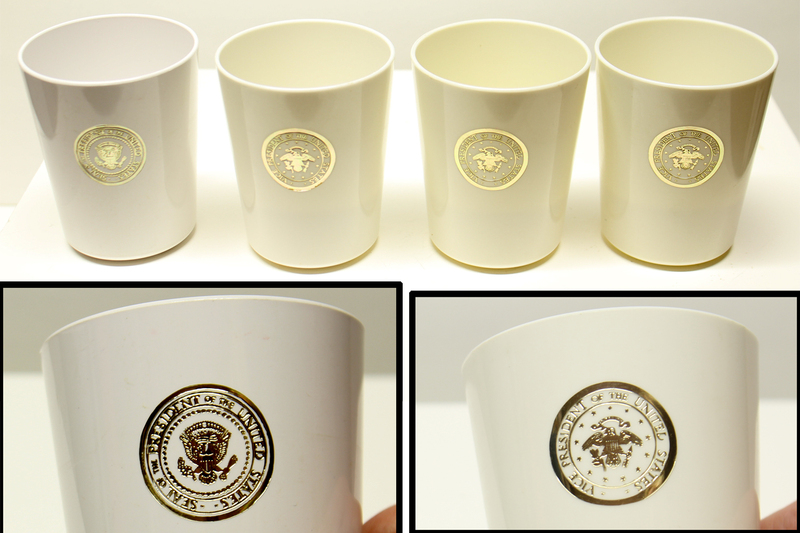 I have 4 white/cream colored hard plastic cups with the seal of the President of The United States on one and the seal of The Vice President of the United States on the three others. 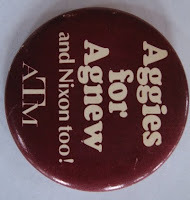 I have been told they are from the 1970's. 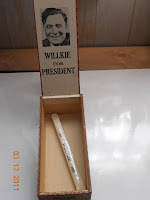 I purchased them at an estate sale near Vandenberg Air Force Base in California. I would interested to know their value? If you can help Harlene, please click on the comments button. 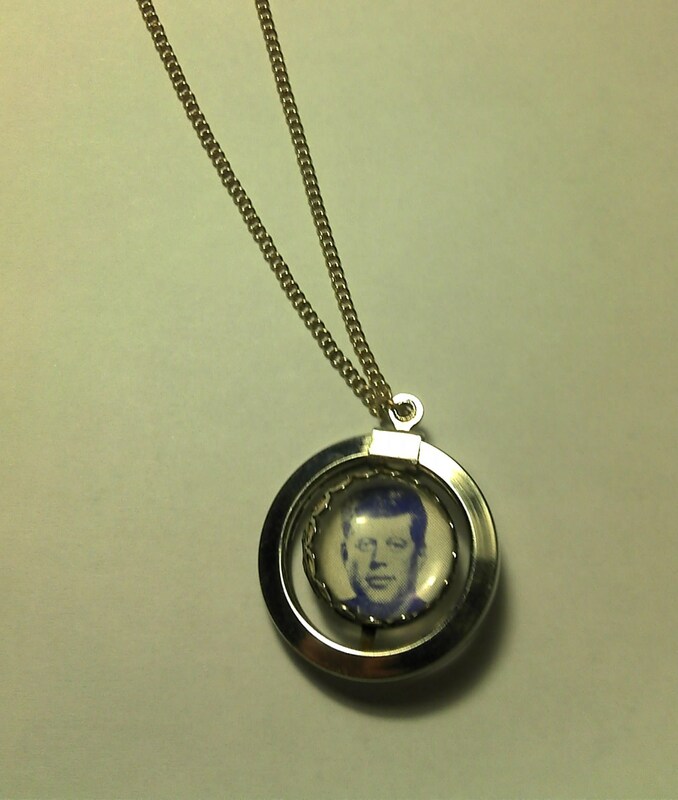 Kennedy White House Key FOB? 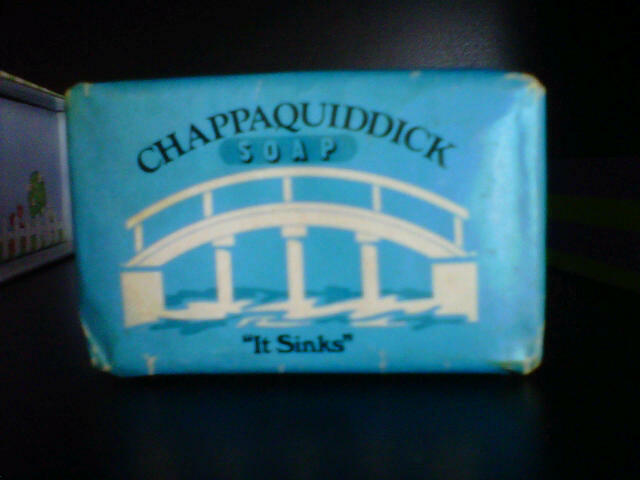 I recently found under the car mat of an old 1961 Lincoln sedan. 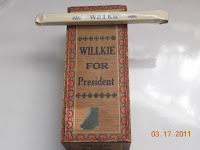 A preliminary search turned up nothing but to be honest, I'm not very well versed in American political anything so when I came across your site, I wondered if you could be of assistance. Have you ever come across a key fob like this ? What was it a key fob for (other than keys)? What was it issued for? Is it even politically related or was there a hotel called The Whitehouse ? FREE The Times XXII. 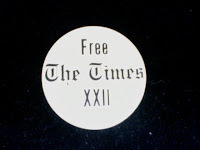 I worked at the Detroit Free Press at the time, and was given this button as a gift. The front of the button is in perfect shape. The back interior some small spots of rust. If you can help Deyna please click on the comment button. I have attached pictures of a necklace I found. Would you be able to appraise the necklace and let me know something about it? I'm not sure of the origin or it's worth and I have not found any information on the internet. Thank you for any assistance you can provide! If you can help Carol please click on the comment button. I have an old JFK bust that I have unsuccessfully searched for information on for years. The bust is solid marble, I believe and the base is wood. It is about 11 inches tall. Do you have any information on this bust, or an estimated value? I just took a close look at the bust and cannot find any kind of marking. But, I have just noticed that the wooden base may have been added to the bust. It looks like it may have been glued onto the top portion, and not be original to the bust. The base is nice, but there is visible glue and the fit to the base of the bust is not perfect. I'm not an expert, though. so it could have been made this way. The top of the bust is what I assume is marble, in an ivory color, and very heavy. 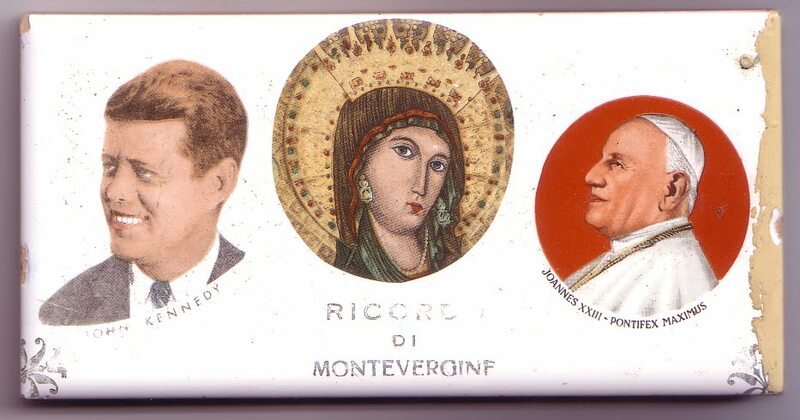 I don't know if busts were made of actual ivory, but it almost feels like it could be made of ivory, if not marble. If you can help Stephanie please click on the comment button. i had a question bout a couple small items i had of John. 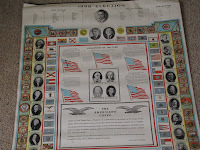 F. Kennedy and was wondering if you could tell me what they are worth if anything. i have a vinyl record of John F. Kennedy speeches and i have a newspaper from the day jfk was shot. If you can help Melissa please click on the comment button. 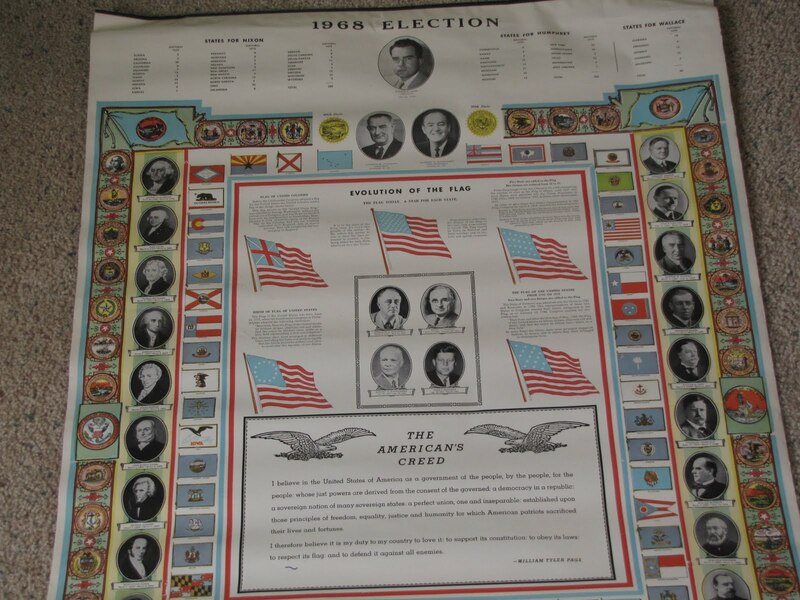 I have a 1968 Nixon, Humphrey Wallace poster with attached maps, prior presidents, world flags, state crests etc. Anyone buy these? I have never seen one , please help. If you can help Scott, please lick on the comment button. Thanks! Submitted by Nancy: I was wondering if you can help. Have recently acquired this JFK poster. I have searched all over online for it and there seems to be no information. If you can help Nancy, please click on the comment button. 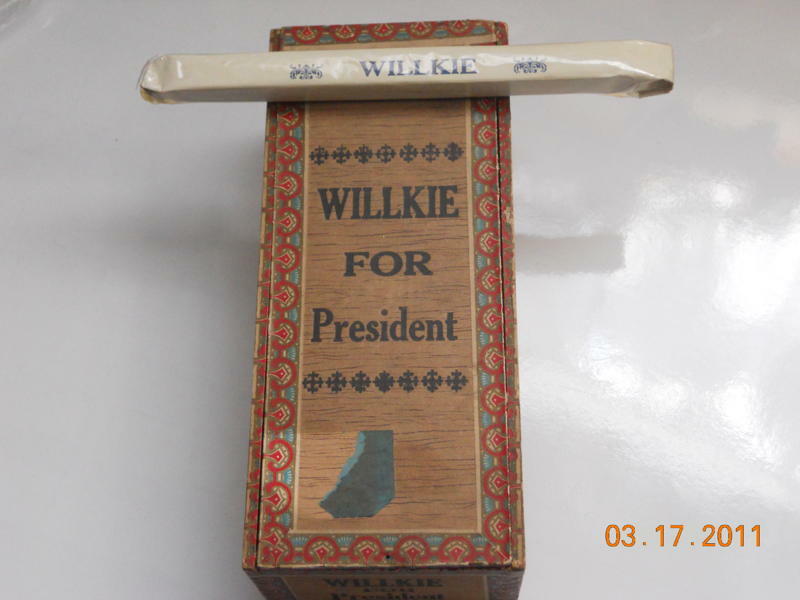 Wendell Willkie campaign cigar box. 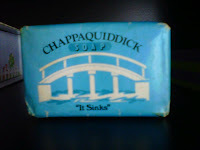 Box is 8.5" long x 3.5" wide. 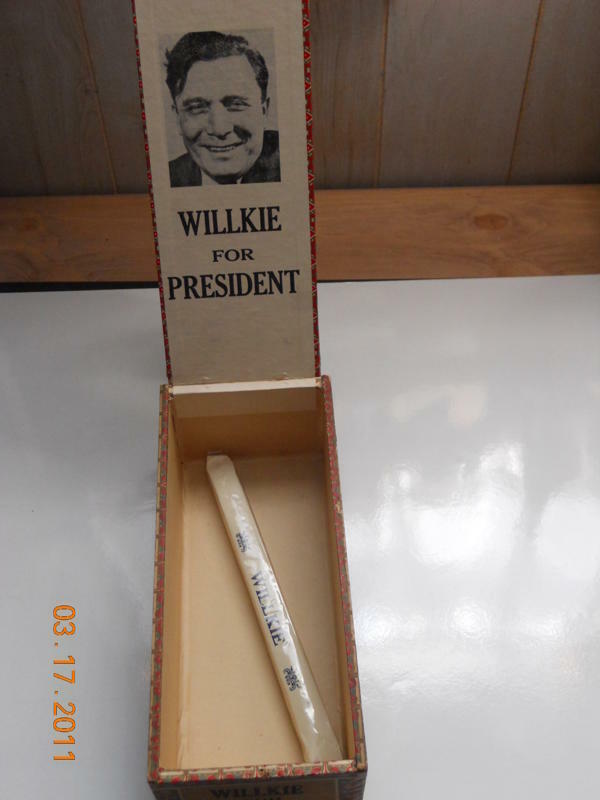 Includes one cigar. If you can help Bill value the item, or would like to make an offer to purchase it from Bill directly, please click on the comment button. 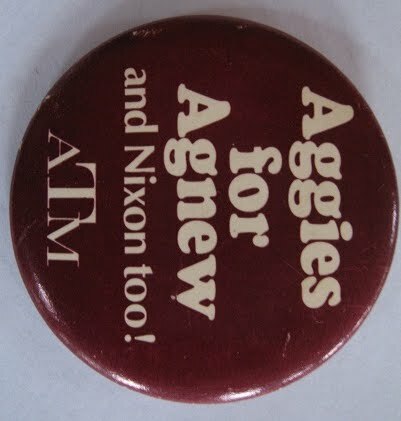 Wondering how much this would be worth. 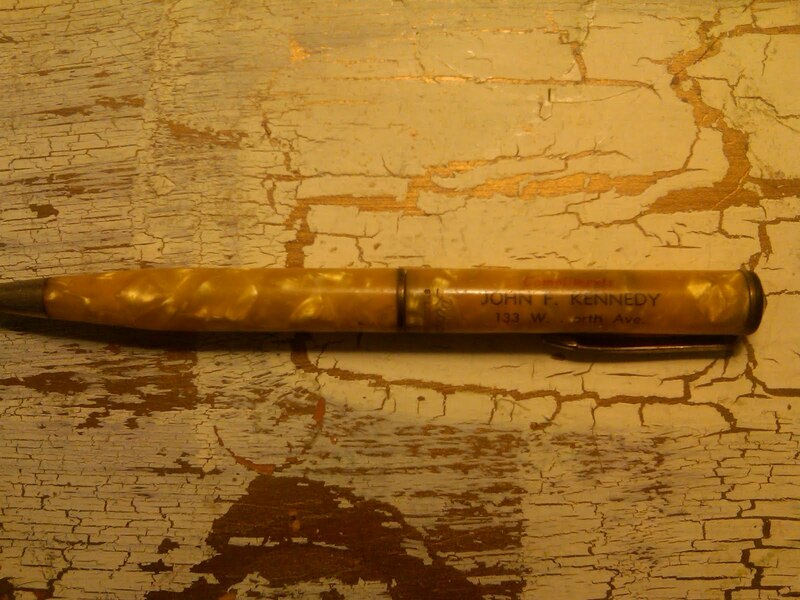 It’s a mechanical pencil- printed on the barrel it reads “Compliments John F. Kennedy 133 W. North Ave.” Also be curious to know if you have any info on that address. If you can help Larry, please click on the comment button. He would appreciate your help.